If you’re looking for delicious Vegan Asparagus Recipes, you’ve come to the right place! These recipes from some of the best bloggers showcase the various ways this seasonal vegetable can be used. From soups to tacos to pasta, there’s something for everyone! Asparagus is a very versatile ingredient. It’s an excellent source of vitamin K, folate, copper, selenium, vitamin B1, vitamin B2, vitamin C, and vitamin E.
Plus it’s a very good source of dietary fiber, manganese, phosphorus, vitamin B3, potassium, choline, vitamin A, zinc, iron, protein, vitamin B6, and pantothenic acid. Now that’s an amazing vegetable! But if that doesn’t convince you to eat more of these green spears, I bet these tasty recipes will. Whether you want to enjoy asparagus as a side dish or make it the star of the main course, you can’t go wrong with these Vegan Asparagus Recipes. One of my favorite ways to prepare the green vegetable is by making Marinated Asparagus Spears. This quick recipe only requires a few ingredients and 15 minutes of your time. Sometimes keeping things simple is the best, as demonstrated by Sarah of Fried Dandelions with her Roasted Asparagus with Lemon. Not only is this recipe easy to make, it’s delicious served with just about everything. Cadry of Cadry’s Kitchen takes roasting a step further by adding garbanzo beans and greens in her Roasted Asparagus with Chickpeas and Spinach. Served with creamy polenta, it’s a complete nutritious meal. Asparagus is also wonderful with pasta and quinoa. Mary Ellen of VNutrition uses it in her protein-packed One-Pot Lentil Quinoa with Asparagus and Peas. I love to combine is with a lemony cashew-based sauce in Creamy Asparagus Pasta. It’s like spring on a plate. And I love how Dana of Minimalist Baker utilizes the veggie in her Creamy Mushroom and Asparagus Pasta. Sam of It Doesn’t Taste Like Chicken has her own version with her Creamy Vegan Lemon & Asparagus Pasta. Asparagus and citrus is a wonderful combination. Another variation is Lemon Orzo with Asparagus and Chickpeas. It’s a complete meal high in protein and fiber. But don’t worry if you’re avoiding grains or want a vegetable-centric meal. Jackie of Vegan Yack Attack makes a delicious Grilled Asparagus with Cream Sauce over Ribbons. Any collection of Vegan Asparagus Recipes wouldn’t be complete without some soups. Rhian of Rhian’s Recipes makes a mouth-watering Vegan Cream of Asparagus Soup. And check out this Roasted Asparagus Soup with Pistachio Cream shared by Trish of Rhubarbarians. There are so many ways to make classic soups dairy-free. Asparagus is also fantastic in Asian-inspired dishes. First off, check out this recipe for Shaved Purple Asparagus & Asian Vegetable Soba Noodles from Rebecca of Strength & Sunshine. If you can’t find purple asparagus, you can use the more common green variety to make it. And you can never go wrong with stir-fry! I love this colorful Spring Vegetable Stir-Fry from the team at Well Vegan. I found even more creative Vegan Asparagus Recipes. Look at this Vegan Asparagus Tart shared by Dianne of Dianne’s Vegan Kitchen. I’m drooling over these Easy Asparagus & Black Bean Tacos from Jeni of Thyme & Love. Finally, asparagus is one of my favorite ingredients in salads. 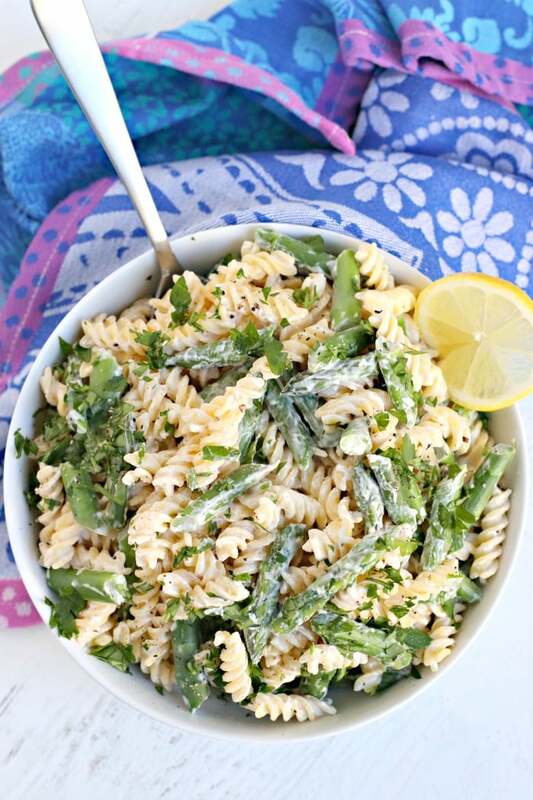 I love how Mel of A Virtual Vegan uses it in her Creamy Asparagus Lemon Pasta Salad. And my personal favorite is my Asparagus Avocado Salad. I’m a sucker for anything with avocado. I hope you enjoy these Vegan Asparagus Recipes as much as I do. If you make any of them, I would love to see your creations! What an awesome line-up, Amy! Fresh, in season asparagus is one of the best things about spring. Thanks for compiling all of these recipes in one place for easy cooking, and for including mine! So many yummy recipes! Thank you for including the asparagus tart from my blog! Oooh yum! All of these look so good, I’m not sure which to try first! Excited to pick some more up at the farmer’s market soon! Thanks for sharing your recipe, Mary Ellen!